W. Somerset Maugham (1874-1965) was a prolific British playwright, novelist and short story writer, who, in his day, was among the most popular writers in the English-speaking world. He was most productive during the first half of the last century, and was said to be the highest-paid author in London during the 1930s. He travelled extensively in Asia, and wrote about his experiences in books such as On a Chinese Screen, and The Gentleman in the Parlour, an account of his travels in Burma and Vietnam. He wrote a series of short stories set in colonial Singapore and Malaya. My Maugham Collection is a blog focussing specifically on the blogger’s collection of first editions of Maugham’s books, and, more generally, on all things Maugham-related. Here, the blogger discusses On a Chinese Screen. The book is mostly composed of a collection of quick sketches of Westerners who are out of their depth in China. It casts a sharp eye over, amongst others, colonial administrators, missionaries, businessmen, and overbearing women. 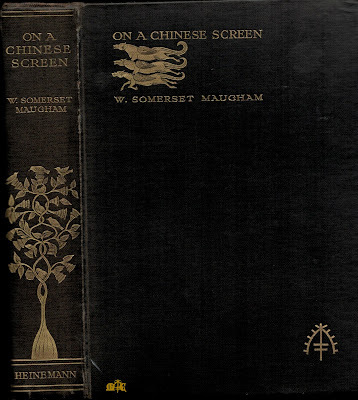 W. Somerset Maugham went to China in September 1919, a trip that lasted for six months. Though he had already travelled widely at the age of 45, it was the first time he encountered a completely alien culture, the Far East, that had fascinated him since boyhood. As shown by his latest biographer Selina Hastings in The Secret Lives of Somerset Maugham, the visit to China was a success and in letters that he wrote more than 15 years later, he recalled Peking very fondly. 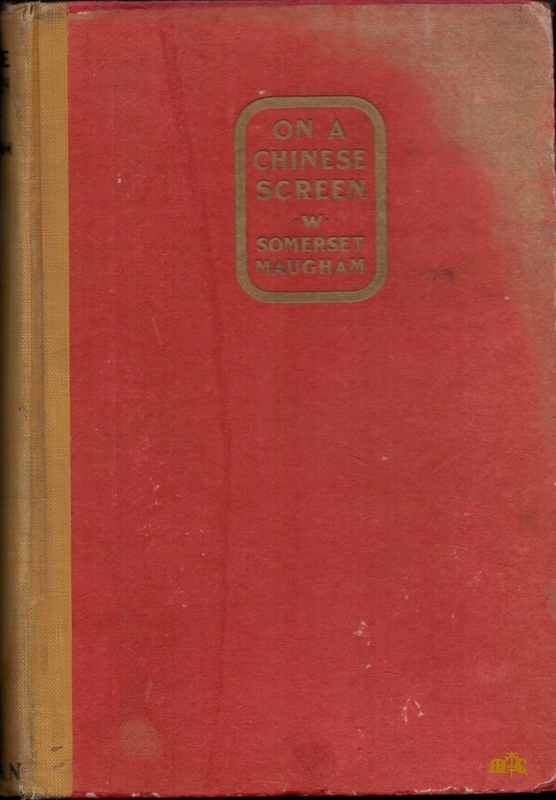 From this trip, Maugham produced 3 works: a play (East of Suez), a novel (The Painted Veil), and lastly, a travel book (On a Chinese Screen). Perhaps Maugham is more widely known as a novelist and a story teller nowadays. However, he was also a very successful dramatist in his time and penned a number of non-fiction books, three of which are travel books. On a Chinese Screen (1922) is one of them. This book plays an important role in Maugham's development as a professional writer, opening a new path to another genre for him. Before this book, Maugham tried his hands at travel writing as early as in 1905. The Land of the Blessed Virgin was a tribute to his beloved Spain, a symbol of freedom and possibilities. Nevertheless, he wasn't too proud of this youthful endeavour, and indeed, it was one of the books he chose to exclude from the collected edition of his works. What came to be On a Chinese Screen was a happy happenstance. On his way, Maugham recorded impressions of scenery and people, intending to use these notes to write up novels or short stories upon his return. But when he got home, he found the freshness of his descriptions enchanting and any attempt to string them together into a coherent narrative would ruin it. Thus, he revised his rough draft and had it published as a non-fiction work. The book was very well-received. And Maugham has found a breakthrough from his old models of travel writing. On a Chinese Screen at times challenges the boundary between fiction and non-fiction, and some of the chapters are published as short stories in magazines and later collections. Maugham explains in the preface of The Travel Books (1955) that it is because "at one period of my life almost everyone I met, almost everything that happened to me and every incident I witnessed or was told of, shaped itself into a short story." Two years later, he went back to the Far East with writing another travel book in mind. He built on what he had learnt in On a Chinese Screen and produced The Gentleman in the Parlour in 1930. Maugham's focus is not on the description or the history of the places he visits, nor does he attempt to understand their peoples. What seems to capture his fascination most is the displaced persons and their relationship to this foreign country, a relationship that reveals something otherwise hidden in one's personality. Among the 58 chapters in On a Chinese Screen, 15 are descriptions of scenery and 10 are portraits of natives - their appearances or actions - of which only 2 relate a direct interaction between the natives and the author. But fully 32 are on expatriates that Maugham met, and one chapter describes the homesickness he felt. The chapters depict a deep divide between the two cultures, broadly defined as Eastern and Western. The expats that Maugham portrays are both unable and unwilling to burrow into this country that they now call home. There is a mixture of arrogance, a lack of interest, and a troubling homesickness for a home that perhaps is no longer as they remember it. Maugham himself seemed to be influenced by this homesickness, though he was only but a few months away from a more familiar culture. One day he found himself transposed momentarily to his London home while shivering in the cold rain, with only an uncomfortable Chinese inn to look forward to as destination. There he was, at home, presumably after his Eastern journey, with his little daughter. It is a glimpse, a rare moment in all his works, of a warm picture of his domestic life. The people Maugham encountered during his journey were necessarily limited to a restricted circle. The two Chinese, a philosopher and a student of drama, that Maugham met present opposite pictures. One is a proud philosopher in traditional Chinese costume, the other a student of drama in European clothing hoping for some wisdom from Maugham. Both have received European education. However, one is deeply resentful of Western superiority and armed invasion, and the other is pathetically compartmentalised. His ability, or otherwise, to understand Western culture is indicated by the heavy tweed he is wearing on a warm day. At the other end of the spectrum is the sinologue, one of the Westerners included in the book who “knows more Chinese than any man in China”, but the language and the culture and the country he knows are what are printed on paper, devoid of life, even when he is living in the midst of them. Foreigners who show any interest in the Chinese are eyed suspiciously by the expat community and they are often seen as not quite right in the head. Maugham's message seems to be that bridging two cultures is an insurmountable task. As an outsider to the two communities, he is able to observe the inherent misunderstanding between them, which would take a major reshuffling of attitudes to overcome. The China that Maugham recorded a little short of a century ago naturally is very different from the China now, together with the natives and the expats in it, but the feeling of displacement, the sense of loss, of disjointed memories, the momentary transposition to a particular space and time one calls home can still be very present in any expat, anywhere.